Whenever you see the words alba or album as part of a plant name, you can expect to see something white, most often flower colour. This plant is no exception. 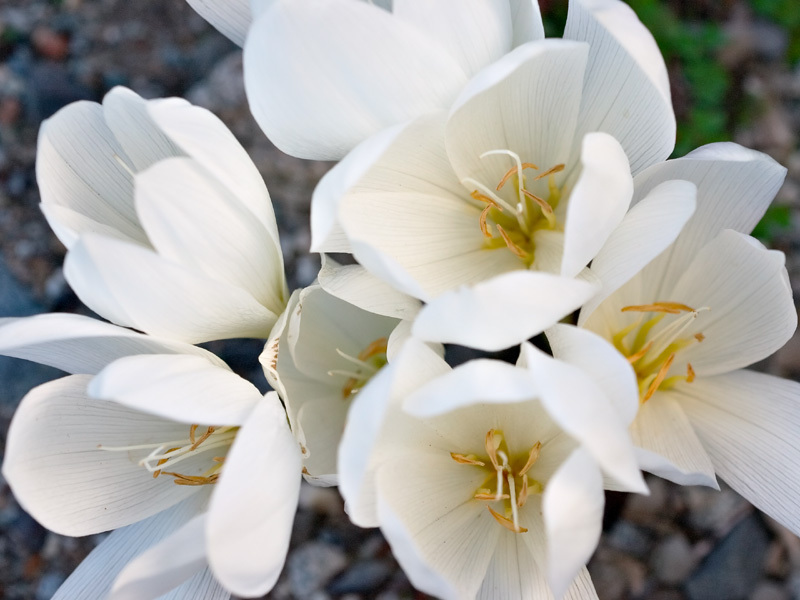 The species Colchicum speciosum has a bright pink flower with a white throat. The cultivar ‘Album’, however, has lost the pink pigmentation. It is likely that the reason for the loss of pigmentation is a small mutation that prevents production of pigment, but that’s speculation on my part (and I’m quite open to seeing any evidence on the matter). If you’re a gardener, you might like to visit Jane Perrone’s Blog, based out of London, England. Jane’s been visiting Vancouver recently, and I had the pleasure of giving her a bit of a tour of UBC Botanical Garden yesterday. We paid particular attention to the Food Garden, as Jane is keenly interested in allotment gardening (read more about that on her weblog). Jane also told the tale that whenever she brings Swiss chard ‘Bright Lights’ into the office to share, her coworkers don’t believe the colours are real. It’s certainly a conversation-starter! Photography resource link: Darwin Wiggett’s The Art of Communicating with Light (via Nature Photographers Online) delves into the importance of understanding light in photography. After seeing your site mentioned in Science (Netwatch), I am now a frequent downloader of your wonderful botanical photographs. My artist friends are also fans of this website. Thank you. I was totally fascinated by your lecture to the Hardy Plant Group…thank you so much for your presentation which was so rivetting I could have listened for even more of the story. Also enjoy your excellent Flower of the day photos and comments. You’re welcome Rae – it was a pleasure to talk with the Vancouver Hardy Plant Group. My only regret is that I didn’t make arrangements to spend the whole day at the workshop. Leave a Reply to Daniel Mosquin Click here to cancel reply.